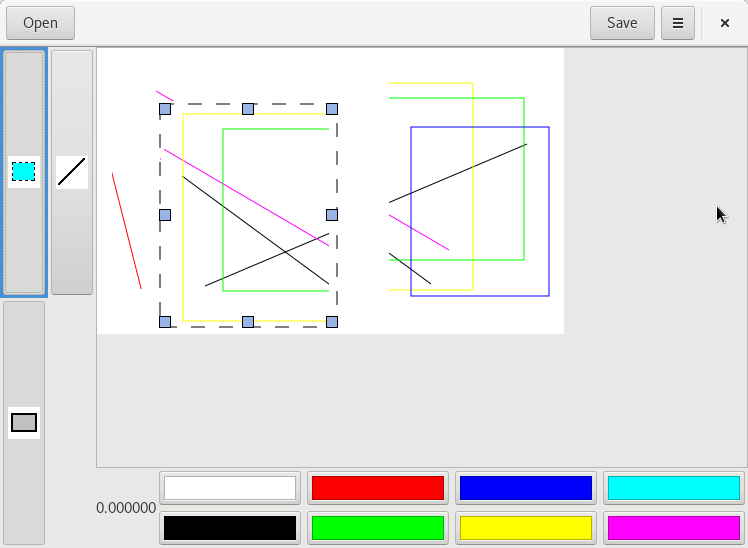 I've started working on simple drawing application for GNOME. Current state - just started (see the current screenshot ), but progressing. Help needed (especially UX guys). Hey, but what about GIMP? Sorry to say that, but it's not a SIMPLE image editor. Every time when I tried to do something that would be simple in MS Paint, I had to search for a tutorial. Every single time. That's true, I didn't spend that much time on doing the research. However, after a few failures, I was just tired of this. I just wanted to do a simple modification, so I finally ended up with an app that I used to use some time ago, which was stable, functional, and simple. Now I'm aware of a few more apps (Pinta, mtpaint etc). I finally want to dive deep into the GTK+ framework. I used to use it for several projects (mostly GTKMM), but without deep understanding of the framework, and working on a real project is IMO a better way for learning the framework than just reading the manual. I'm going to use it a lot, and it's also fun using software that you made on your own. See the screenshot below. I've high-level design and some basic data structures, but still missing minimal functionality, so it's not even close to the first release. Also, the UI needs to be re-done (but I didn't pay attention to the UI so far). Hopefully, I'll be able to do a simple demo of the first release during the lightning session at GUADEC, but no promises. Any help (most important - UX, GNOME HIG experts) very welcome!